The fight is on for one of the Dutch club's biggest assets. Manchester United, Manchester City, Arsenal, and Liverpool will reportedly go head-to-head in a bid to sign Ajax star Hakim Ziyech. The 26 year-old Moroccan playmaker has been linked with a move to the Premier League following his recent rise. What impact will the UCL and UEL quarter-final results have on the domestic leagues? The European results on Tuesday, Wednesday, and Thursday will play a crucial role in the final rounds of Europe's top-flight leagues. The Dutch outfit will get two extra days off while they gear up for the trip to London. The ties were already defined, but now we know the order in which both ties will be played. The Catalan club is supposedly close to making the Dutch defender its second acquisition from Ajax this year. La Liga heavyweights Barcelona are reportedly closing in on the signing of Ajax sensation Matthijs de Ligt. The 19-year-old Dutch centre back has been heavily link with a move to Camp Nou in recent times and a supposed move is seemingly near completion. The Eredevisie giant put in an amazing performance in Turin to eliminate Cristiano and Co, registering quite a few records along the way. Tuesday night will forever remain in the memory of Ajax fans. After coming back from a 2-1 home defeat to win at Santiago Bernabeu and eliminate Real Madrid, the Dutch side dumped another European giant out of the competition while on the road. The Portuguese ace was not able to lead Juve to the semi-finals, which will also see him miss out on the chance of winning four UCL titles in a row. Cristiano Ronaldo tried, but his presence on the pitch was not enough to help Juventus make it to the semi-finals of the UEFA Champions League. The Portuguese ace gave Juve the lead, but Video Assistant Referee technology almost disallowed it due to a confusion. Cristiano Ronaldo continued his dominance against Ajax...but his goal was on the verge of being disallowed due to a curious incident. Juventus will lock horns with Ajax as the Bianconeri battle to secure a spot in the semi-finals on Tuesday, April 16th. Live Soccer TV's match preview provides match facts, team news, and global broadcast listings for Juventus vs Ajax. ESPN+ subscribers can rest assured as ESPN's streaming services has tons of thrilling games scheduled for the next 11 days. Everything from action in Europe to North America will be on the air. Ajax have been one of this season's surprise packages. Will they stage another major upset as they take on Serie A heavyweights Juventus? 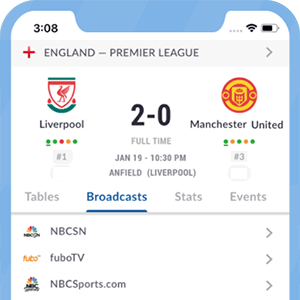 Live Soccer TV's match preview provides match facts, team news, and global broadcast listings for Ajax vs Juventus. Unfortunately, it's not all good news for Allegri's side, since there will be some major absences for them to deal with in the first leg. Tottenham vs Man City, Man United vs Barcelona, Ajax vs Juventus, and Arsenal vs Napoli are a few of our picks for must-watch games this midweek. The Portuguese superstar picked up an injury during the international break and could sit out the crucial trip to Amsterdam. Despite Cristiano Ronaldo's attempts to calm down the fears, it looks like the Portuguese superstar could miss his team's trip to Ajax in the Champions League. The conclusion of the international break introduces the return of club football and a host of blockbuster clashes including Ajax-PSV, Roma-Fiorentina, and Toronto FC-NYFC are imminent. The Dutch defender is being followed closely by Barcelona execs, but the Spanish giants will need to part ways with one of their top players to comply with FFP rules. Rumors keep circling around the two biggest clubs in Spain, and now, it's Barcelona's future that seems to be subject for a turn in the rumor mill. The premium streaming service amd the television network will be providing coverage for the four knockout matches. The likes of Barcelona, Juventus, and Liverpool have shown great interest in the promising Dutch center-back. Matthijs de Ligt is an undeniable talent being watched by several European heavyweights, but one team appears to have snatched the lead in the race to land the young Dutchman.